For me, as a political news junkie, nothing is more fascinating and dramatic than modern democratic politics, yet, as Russell Brand explained so vividly on Newsnight recently, the decision by many people to withdraw from the political process, may be quite a rational one. It was in this mood that I attended the David Bowie is…exhibition at the Victoria and Albert Museum over the summer, and found myself in a world so rich in image that I started to think about what analogies, if any, we could draw between the world of Bowie and the world of Westminster politics. Working in PR before starting my PhD in political communications, I approached the idea of image as a cluster of ideas that form a public perception, and yet I had not seriously thought about what image actually means in the context of promotional culture. By pursuing a promotional model of image making, are politicians responsible at least in part for contributing to a sense of exclusion on the part of the public? Take a look at this ancient image from 37,300 years ago – stencils created by blowing pigment over an outstretched hand that are found all over the world. These are from Spain and, by their dimensions, are thought to be female. 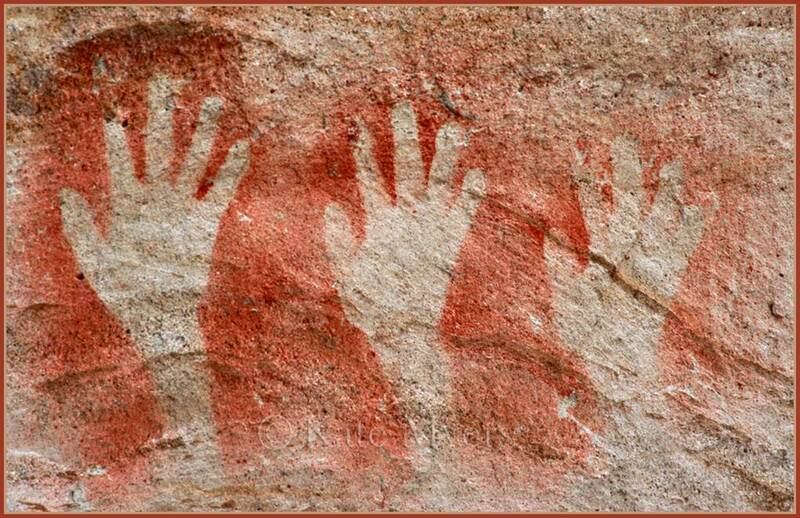 This image – literally an imprint – is an image of ‘commonality’ which helps define a community, where the hand is a metonym for humankind. In this, the image is inherently social and egalitarian. It does not exist on its own: there is a back story about how and why these images were made, what role they played in ritual, and a forward story on how they have been seen and interpreted since. Contrast this with another ancient image, this time from the 14th century, which depicts the ideal of absolute power. 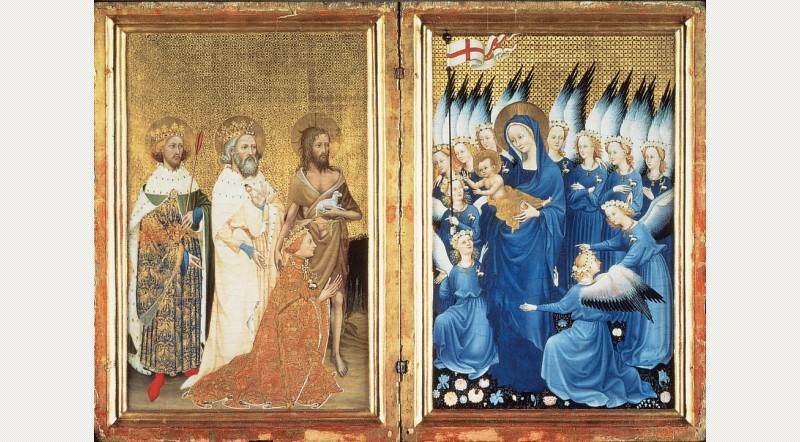 The Wilton Diptych is a portable altarpiece, 50 cm high, commissioned by the English King Richard II. This lavish depiction of the divine right of kings was designed to be seen by the very few – those in the King’s own privy chamber, then as now, the seat of power – as he made his Royal progress. The King is seen here being presented to the virgin and child by his three personal saints, watched by a host of angels wearing the King’s white hart motif on their robes. The king was deposed and murdered at 33 when he tried to rule without consent of the barons, ushering in a period of instability that lasted nearly 100 years. The diptych is now in the National Gallery and can be bought for 70p as a postcard. How should we compare these two ancient images, with the mass of mainly disposable imagery circulating in our time? Perhaps they are not so different. Both display a marked asymmetric relationship between producer and recipients that I think challenges Thompson’s (Thompson, 2005) idea that most interaction before the arrival of communication media was mainly face to face. He argued that “mediated quasi-interaction” was a modern phenomenon whereby symbolic forms are produced for an indefinite range of potential recipients and the flow of communication is mainly one way. I see these ancient images as a form of mediated quasi-interaction but in time rather than space, also aimed at an indefinite range of recipients. Over hundreds of years, powerful imagery was shared by mainly illiterate people from all walks of life, not only at their local place of worship and in the home through domestic shrines, but also through pilgrimage. Buildings like the pyramids, the mosques and cathedrals weren’t just structures, they were forms of communication – and just as asymmetric as modern forms of media communication. 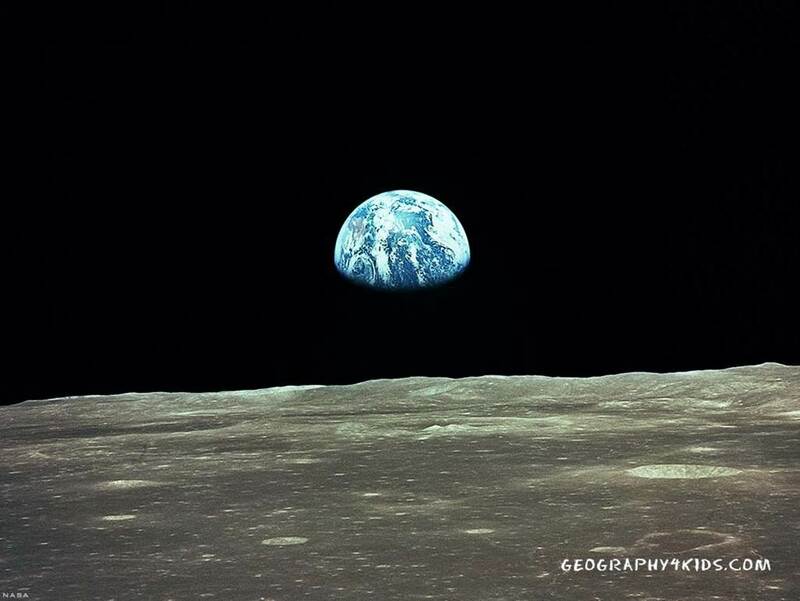 This image was shown at the exhibition, David Bowie is…Earthrise over the lunar horizon, taken by an astronaut in 1968 presents probably the greatest asymmetry between producer and consumer you can imagine, since only 356 humans have left the earth so would be in a position to have witnessed this themselves. At the exhibition, this image was described as one of the sources of inspiration for Space Oddity, Bowie’s first hit single after seven years of struggle, which was rush-released on 11 July 1969 to coincide with the Apollo 11 moon landing on 21 July. Space Oddity was used as part of the BBC’s coverage of the moon landing. However, it was another three years before Bowie had another hit and launched himself as Ziggy Stardust. So what struck me about the exhibition? We wore headphones where sound was triggered by the exhibit you were standing by. We moved around each other carefully, never touching, although the place was very crowded. We were in our own worlds but also together. It was as if the exhibition itself was a form of social configuration – a dance – where patterns and relations are being created by individuals in motion but within limits. At the end we met in a large space where huge screens showed Bowie performing live. It was as if the audience was being reconstituted. 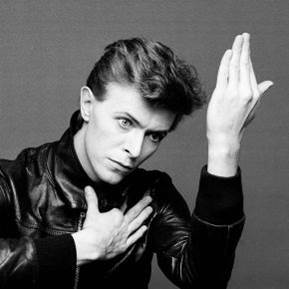 David Robert Jones, the man behind Bowie, was truly common in the literal sense. The year of his birth, 1947, was the peak year of the baby boom. One of the first exhibits was a map of Britain showing in dots where babies were born that year. He came from an ordinary family and was brought up in a very ordinary London suburb. You could see the source of so many familiar images from Bowie’s roughly drawn sketchbooks; even the original handwritten lyrics. Looking at the painstaking construction of David Bowie and his various alter egos, it made me wonder for the first time – who is David Robert Jones? 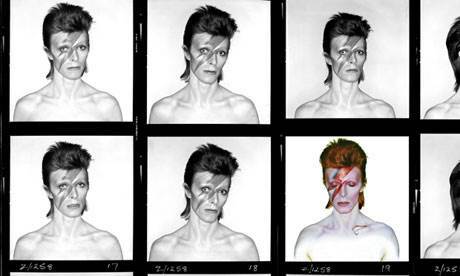 This contact sheet of Brian Duffy photos of Bowie as Aladdin Sane shows the editing process involved in the creation of one Bowie persona. For both the performer and the audience – Bowie is brought into being through a shared imaginative space. As Tetzlaff has said: “Authenticity is not created by performers, nor embodied in their character. It is created by fan cultures and embodied in the sign systems they use to articulate their sense of the real”. (Tetzlaff, 1994). Yes, there is huge asymmetry between Bowie the musician and artist, and his mass audience, and yet, because he attracts and feeds off the collective around him, he becomes representative of us – even to the extent of helping us to define ourselves. 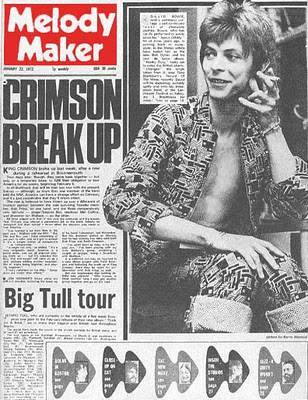 On the cusp of fame, in early 1972, Bowie told Melody Maker that he was gay, demonstrating one of the characteristics of rock and roll – its capacity to represent transgression. As John Street has said, it “is a sort of inchoate politics – an assertion that all is not right with the world, that the situation must be faced up to…a testimony to the frustration of things-as-they-are and the joy of violating the rules” (Street 2012). As Bowie has said: “The fabric of my work is using my body, my personality, as well as my songs and stage performance, rather as a canvas” (Buckley, 1999). 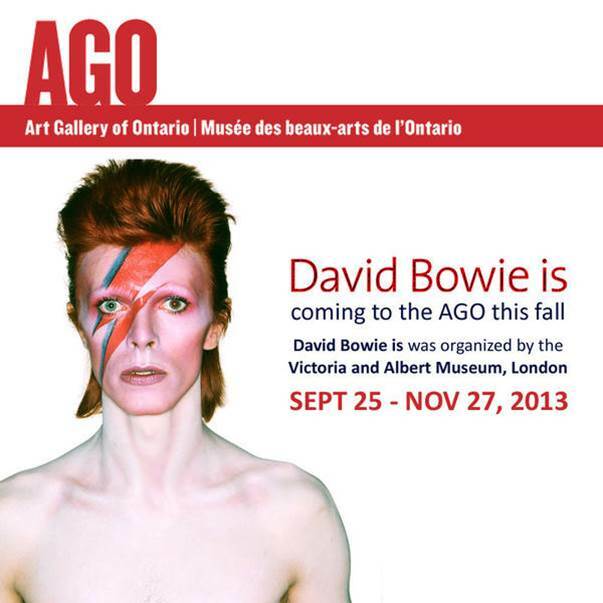 Bowie is known for wearing masks and is a highly mediated, even a virtual, pop star. The real David Robert Jones remains hidden. “The important thing is the music, the musicians and how long I play on stage”, he told TV interviewer Russell Harty in 1975. “The content has to astound. If the show is not substantial there will be no impact”. The impact continues. Bowie has just had a hit album, The Next Day. A video posted by Commander Chris Hadfield, the Canadian astronaut, singing Space Oddity from the International Space station in May this year – received 19 million YouTube views. We can see conceive of image as a manifestation of a deeper process – rather as a light filament is the visible manifestation of an electric circuit. With Bowie, the circuit fizzles with activity – participation, identity formation, money making, excitement, colour, movement. Modern mainstream politics, in contrast, is ischaemic. For many on the outside looking in, the political circuit appears blocked, especially at the point where politicians attempt to connect with the public. For the elite – journalists, MPs or the “chattering classes” – the political space appears to buzz with incident, argument, debate, drama. For those looking in, the experience is deadening, even bewildering. In music, as with Bowie, the excitement of the shared space between performer and audience is a joint creation. In politics too, there is such a thing as a political awakening, particularly in youth, but what image of youth is portrayed by politicians, and how do they present themselves to the voters of the future? A whole generation of young British people has observed broken promises over student loans, and seen or experienced “kettling” when they protest.